Well hello and a very belated Happy New Year dear reader! I’ve been away from the blog for a few weeks with the holidays, and lots and lots of company from Thanksgiving all the way through the beginning of January, and as much as I enjoyed it, it’s kind of nice to be back to my old schedule. Did you make any New Year’s resolutions? I have a few, and I’ll tell you about most in the next few weeks (I have to be accountable to someone right? ), but one of my food/diet/health resolutions is to eat more salads. It’s not that I don’t like them – I really do! But it’s the thought of making them that I hate 🙁 So I’m working on making them big enough to count as a meal, or eat for several days, so it doesn’t feel like such a chore. I’m starting off my first post of 2015 with a Meatless Monday warm winter salad that definitely has enough food groups right in one bowl to count as a full meal. I love this recipe not only because it tastes so yum, but also because it makes a large batch. It’s perfect warm as a main meal or side dish, or take the cold leftovers for lunch the next day. 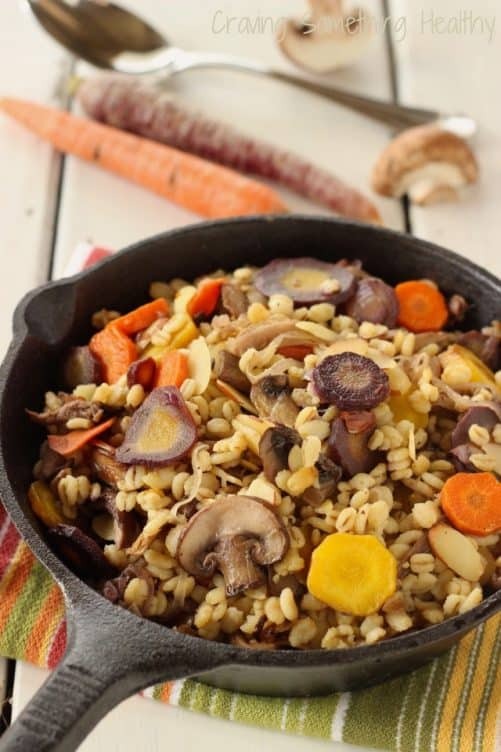 Mushroom barley soup is one of my favorite winter comfort foods, and this salad-version tastes much like the soup, but it works well for my new and improved not-so-cold Arizona winters! Did you know barley is one of the best sources of the type of fiber (soluble) that can reduce your cholesterol? So true! If you don’t usually cook with it, give it a spin – it’s fairly quick cooking, and its chewy texture is so wonderful in soups, salads, or just as a side dish. I’ve been finding rainbow carrots lately at my Sprouts Market, and I love the punch of color they give to recipes like this. If you can find them, do use them – they also have different antioxidants than the plain orange ones, which is always good. If you can’t find them – regular old orange carrots will be just fine. Soak the wild mushrooms in the hot water for about 15-20 minutes, or until softened. Drain the liquid through a coffee filter to trap any grit, and reserve about half the mushroom liquid. Rinse the mushrooms well. Add vegetable or chicken broth to the reserved mushroom liquid to make a total of 2 cups. Place all both in a medium saucepan and bring it to a boil. Add barley to boiling broth. Return to a boil, and them reduce heat to low and simmer for 15-20 minutes until barley is tender. Drain off any remaining liquid and set aside. Cut carrots into thin rounds, about 1/8 inch thick. Slice onions into thin slices. Slice both the wild and fresh mushrooms into thin slices. Place all vegetables in a saute pan and season with olive oil, sherry, salt, thyme and pepper. Saute vegetables on high heat until they are caramelized and start to turn brown. Add sliced almonds and cook for about 3 minutes more. 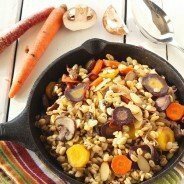 Toss vegetables and barley together in a large bowl. Use rainbow carrots for extra color if you can find them. Have you thought about doing Meatless Mondays as a New Year’s resolution? It’s an easy way to do something good for the planet AND your health! Looks absolutely gorgeous. Love the colors! 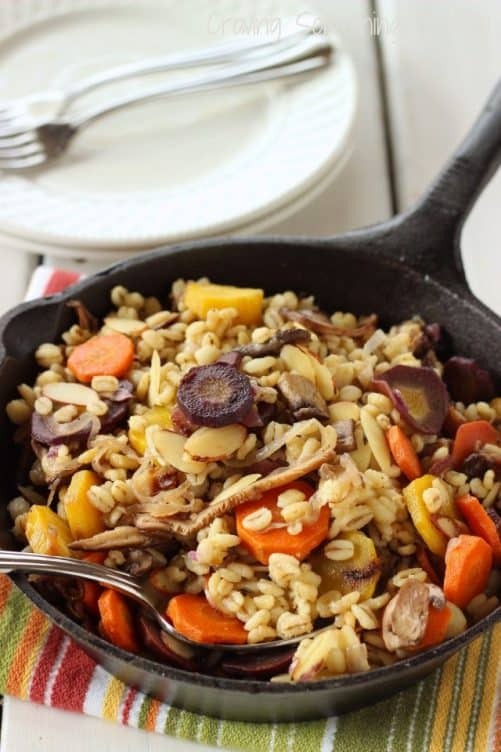 I never actually tried barley but this looks so amazing! so comforting! Oh no! You’re totally missing out. Run right out and get some – you’ll love it! This looks delicious. I could definitely eat this on any night of the week. I adore barley but don’t seem to make it too often. Thanks for sharing! !